Vancouver City Hall and Parks Board are currently in the midst of reviewing the ideas of building a seawall path on a natural section of shoreline from Kitsilano Beach to Jericho Beach, and increasing access along the Fraser River waterfront. These ideas arise every couple decades and raise numerous issues today in 2012. CityHallWatch will try to provide information to aid discussions, likely to resume in September and October. Below is an updated bubble diagram summarizing key aspects (click to enlarge). A. THAT staff support the Vancouver Park Board in their efforts to assess and develop options to expand the seawall from Jericho to Kits Beach, as well as research on environmental impacts, residential security and seawater levels. B. THAT staff continue to develop long-term transportation options for Cornwall and Point Grey Road, which may include a seawall extension. C. THAT staff work with the Park Board to identify possibilities for increasing public access to the waterfront city-wide, including along the Fraser River. 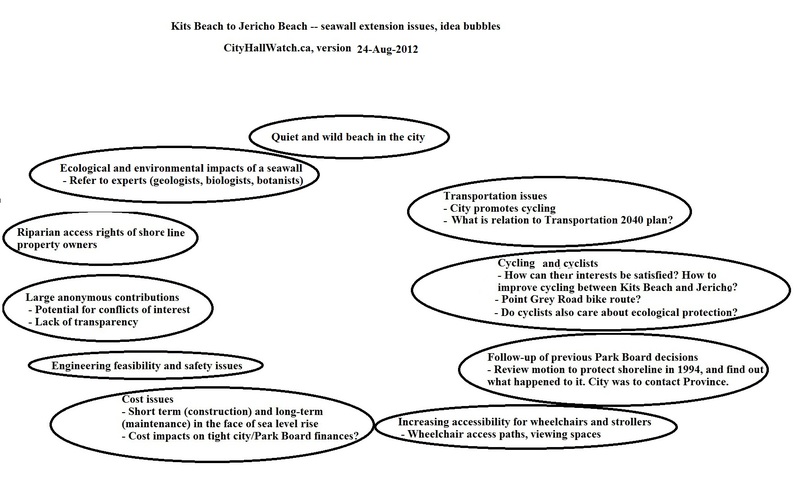 Read our report of the Park Board meeting, and the “Watch Out” checklist below to see what might happen next. Check out the petition http://www.change.org/en-CA/petitions/vancouver-parks-board-keep-kits-beach-wild-say-no-to-the-point-grey-foreshore-seawall. View the “Keep Kits Beach Wild” Facebook page here (must sign in to Facebook) for discussion and updates. View over 100 photos of August 4 walkabout along the shoreline. After nearly 3 hours of waiting, 21 speakers had their chance to express intense opposition to park commissioners, particularly about Vision Vancouver’s Sarah Blyth’s motion to develop options for connecting the seawall from Jericho to Kitsilano Beach. Some speakers also addressed the Fraser shoreline access portion. Speakers included many civic luminaries who said the shoreline should not be altered by putting in a seawall. Reasons included ecology, tranquility, cost, and the need to better understand and respect past public debate and a 1994 decision by the Park Board to keep the area natural. Concerns were also raised about the idea of the City accepting large “anonymous” donations, due to the lack of transparency and potential for corruption. Many implied that the motion itself should be scrapped. One speaker said that the motion should be broken into two — one being for the Fraser River shoreline, and one for the Kit-Jericho beach. One speaker recommended the motion be amended to refer the city’s Greenest City goals, including habitat protection, and to include the option of “no seawall extension,” increased and more formal protection of the shoreline, and consideration of other non-vehicle mobility options that did not include a seawall extension. In the end, the motion was deferred by the winning vote of four Vision commissioners. the NPA’s Melissa De Genova and John Coupar wanted to scrap any further review of the seawall extension idea for Kits to Jericho, and Vision’s Trevor Loke took the unusual move of voting with the NPA — unusual because on City Council and Parks Board Vision Vancouver members typically vote as one solid bloc. Charlie Smith in the Straight reports that the motion was split into two, and the “The second motion passed unanimously, with commissioners asking staff to report back on ways to improve public access along the Fraser River and providing a timeline and cost estimates for these options.” At the end of the meeting Park Board commissioner Aaron Jasper stated in his public comments that quite often when a motion is deferred, as was this one for the Kits to Jericho seawall extension, it never comes back. Perhaps that will be the case this time. Download the original motion: SeawallMotion for 24-Jul-2012. Or read text of the motion at bottom of this page. There has already been much media coverage and opinion. For a fresh list, go to news.google.com and type in the search words “seawall,” “extension” and “vancouver.” You will see scores of articles to choose from. CityHallWatch has heard the opinion expressed the view that our government should NOT accept anonymous donations, or that they should be accepted with a high level of caution. The point is this: If a large amount of money is received by the City in a backroom deal, how is the public to know that favors are not being returned when the City approves any contract, permit, policy, rezoning, or development? Taxpayers, fiscal conservatives – will be concerned about increased financial burden of building and maintaining a sea wall now and in a future with higher sea levels — even with a large anonymous donation to start the project. The Park Board is already financially tight and cutting back on services, even proposing to halt the provision of lifeguards at certain beaches this year to cut costs. What is the relationship, if any, to the Transportation 2040 plans of the City, of a seawall extension that would permit bicycle traffic? We have learned from the Point Grey Natural Foreshore & Waterfowl Sanctuary Protective Society (Foreshore Society for short) that in 1994 (to be confirmed), the Park Board passed a resolution: “That the Board request the City advise the Provincial Government of its desire to keep the Point Grey waterfront as a natural beach, and pursue a lease with the Province for the creation of a Point Grey Foreshore and Marine Sanctuary, with the provision that there be no development, no concrete walkway and no sewer construction on the Point Grey Foreshore.” Mel Lehan, the first speaker to the Park Board on July 23, 2012, said that it appears the City dropped the ball at that point. Perhaps it is time for Vancouver City Hall to pick up that ball again. First step is to review the discussions and decisions of that time. CityHallWatch has obtained a copy of the Assessment of Shoreline Habitat (1990). This appears to be a supplement of what is known as the main “Rabnett Report” to the Parks Board, which we believe was entitled the “Point Grey Road Waterfront Planning Study,” and which are trying to obtain and provide publicly. First Nations: Have they been consulted yet? It appears the Transportation Committee of the Vancouver City Planning Commission is reviewing options for the Fraser River waterfront. See link to minutes of Sept 12 meeting. environmental and First Nations concerns with proposals. Now that a track record has been created by the dominant party at City Hall, based on experience with other policies and decisions, we can predict what might happen next. We have witnessed all of these in the past several years. Charlie Smith’s report that “After the speakers wrapped up their presentations, the Vision Vancouver caucus called for a recess and scurried out of the boardroom for a quick meeting” suggests that Park Board decisions are being made outside of public scrutiny. Check these off as they occur, and note the dates. The Mayor or another City Hall or Park Board official will propose a “task force” or “advisory committee” to look into the issues. Members will be politically appointed. They will hold closed-door meetings and conclude that, after all, a seawall extension from Kits Beach to Jericho is a good idea. Negatives will be downplayed, and emotional reasons to justify a seawall extension will be highlighted. Prominent persons will appear in media expounding the positive benefits of a seawall extension. A report will be released for Council or Board discussion at a time inconvenient for many concerned people to attend. Speakers in favor of the proposal will be rounded up. The rules of meetings may be changed to limit speakers. All efforts will be made to create the illusion of public support and rationality of the proposal. Mainstream media may or may not cover both sides in a balanced way. Pingback: CityHallWatch creates webpage to track debate on seawall extension, shoreline issues. Hot topic at Park Board July 23 | CityHallWatch: Tools for engagement in Vancouver city decisions, creating our future. Certain media and seawall supporters are framing this as 1% vs 99% issue. 99% of us are the 99%. We do not live on the beach along Point Grey Road. I’m a renter and am against the seawall because I depend on this quiet wild beach as an escape from the noise, hustle and stress of city life. I can’t afford to get away to an island cottage or exotic beach somewhere. It costs me nothing to walk from my apartment at 1st & Trafalgar to the beach. There are plenty of seawalls for cyclists, wheelchairs, moms with strollers, skateboarders, rollerbladers etc. Keep Kits Beach Wild! Leave it alone! Pingback: Amid talk of Kits-Jerichio seawall extension, group plans “Point Grey Foreshore Walkabout” 1:30 pm, Sat., August 4 | CityHallWatch: Tools for engagement in Vancouver city decisions, creating our future. Pingback: Heads up on City Hall topics in September 2012 – Community Plans, Affordability Task Force, Seawall, more | CityHallWatch: Tools for engagement in Vancouver city decisions, creating our future. Pingback: Vancouver City Council, Parks Board have called for preservation of Kitsilano shoreline as a natural beach | CityHallWatch: Tools for engagement in Vancouver city decisions, creating our future.